Finding the right dentist for you and your family can be daunting and even overwhelming. With so many dentists to choose from, how can you be sure you are making the right choice? Here at Cobblestone Dentistry, our expert family dentists in Oklahoma City are committed to providing our patients with the most up-to-date information and resources they need to make the right choices pertaining to their oral health. In this blog post, we share a few important guidelines to keep in mind during your search for the right dentist. First things first: you should make sure your dentist has undergone the right training and clinical experience to become a dentist. Dentists are designated as either a DDS (Doctor of Dental Surgery) or DMD (Doctor of Dental Medicine). It’s a good idea to inquire whether your dentist has completed advanced training in addition to dentistry school, in the form of training courses or fellowships in general dentistry or a specialization that you may be looking for (e.g., implant dentistry, cosmetic dentistry). Ask your dentist whether they are a part of any professional dental associations, such as the American Dental Association (ADA), which require members to regularly continue their education and stay-up-to-date with the latest dental procedures and techniques available. Not all dentists offer the same services. For instance, a dentist who specializes in periodontal care may offer better treatment options for gum disease than a general dentist. If you are interested in beautifying your smile, make sure your dentist offers cosmetic dental procedures such as teeth whitening or porcelain veneers. Do you wish to straighten your teeth? Find a dentist who offers orthodontic options like braces or Invisalign. Do you avoid dental care because of anxiety or fear? 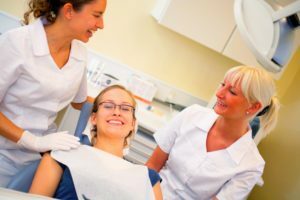 Choosing a dentist who offers sedation dentistry options (e.g., oral sedation, nitrous oxide) can make your dental experience much more comfortable and successful. The latest and most advanced dental technology makes for safer, more effective and comfortable dental treatment. For instance, laser therapy can be used to treat teeth and gums without damaging the surrounding tissues. This leads to less complications, faster recovery and more precise results. It is a good idea to browse through your potential dentist’s website to see what kind of technology they use. If it is not mentioned on their website, call or visit their office to ask. A dentist’s reputation should play an important factor in your decision-making process. Patient reviews found on credible sources like HealthGrades, Yelp and Google My Business are candid and can reveal whether a dentist is professional yet friendly and compassionate. You should work with a dentist whom you trust and with whom you can communicate freely. Cobblestone Dentistry strives to provide exceptional dental care in a comfortable and relaxing environment. We offer a range of general, restorative and cosmetic dental treatments to accommodate the unique needs of our patients. To learn more about our services, please schedule an appointment by calling (405) 603-8520 today.